Our Location - "Dellios Apples"
Dellios Apples is located in Bacchus Marsh in the shire of Moorabool. 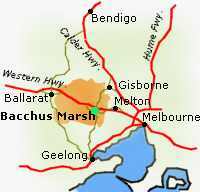 Bacchus Marsh is located 55km West of Melbourne on the Western Highway en-route to Ballarat. It's central location enables an easy 35 minute drive to Ballarat, Geelong or to Melbourne’s Tullamarine Airport, on the Western Freeway, about 55km west of Melbourne CBD.